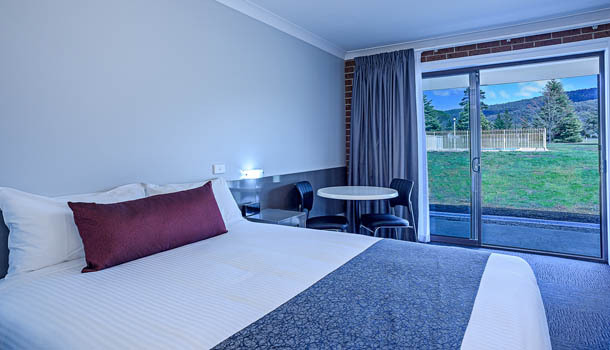 Located 5 km west of Lithgow, the Bushman’s Motor Inn is the perfect place for your next stay. From the sprawling front garden to the rural setting and beautiful mountains, the Bushman’s Motor Inn is sure to satisfy. Renovated in September 2017, our spacious rooms have all the comforts the every-day traveller has come to know and love, giving our rooms a modern feel with country charm. Relax by the pool by day and unwind in our intimate Bar & Bistro by night. Choose your room; Deluxe Queen, Deluxe Twin, Deluxe Family, Heritage Queen, and Heritage Twin and let the Bushman’s do the rest! All rooms have a Fridge, Microwave, Toaster, Kettle, and sleek private Bathroom. Local attractions include: Hassan’s Walls, Small Arms Factory Museum and Blast Furnace Park. The Glow Worm Tunnels, Mayfield Gardens, The Three Sisters, Jenolan Caves, Mudgee (wineries), Capertee Valley (home of the World’s 2nd largest canyon), Bathurst (Mt Panorama) and the picturesque Leura.